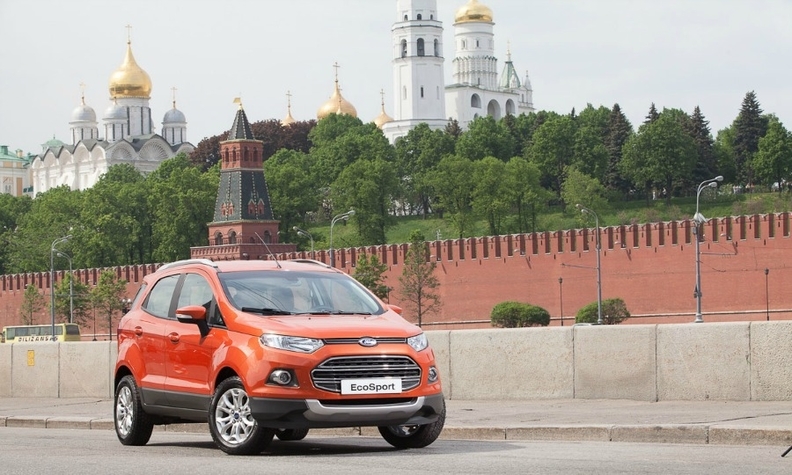 Ford aims to source more parts from Russia, where later this year it will start making the EcoSport subcompact SUV. Russia's "weak" auto parts industry is expected to improve as Tier 1 suppliers such as Visteon and Robert Bosch increase their presence in the market and component makers such as GKN Driveline, TRW Automotive and Getrag consider setting up operations there. The suppliers are being drawn to Russia by automakers that hope to capitalize on forecast growth. Russia's new-vehicle sales are expected to rise to 4.4 million by 2020 from 2.9 million last year, according to consultancy Boston Consulting Group. If that happens Russia would pass Germany to become Europe's largest new-car market. The problem is that only about 25 percent of the parts on locally built cars are produced in Russia. That figure, however, is expected to rise to 30 percent to 35 percent in the next 18 to 24 months, BCG analyst Nikolaus Lang said in an interview. Lang authored a report last summer that singled out local parts sourcing as a big problem in Russia, but he told Automotive News Europe that the situation is getting better: "The localization of international suppliers is improving." Bosch is currently building a second automotive parts factory in Russia. The new plant will be based in Samara, the same state as Renault-Nissan-AvtoVAZ's massive Togliatti factory. Bosch said that by 2015 it plans to invest about 40 million euros in the new location, where it will make antilock braking systems and alternators, mainly for local customers. Visteon strengthened its position in Russia last October when it increased its stake to 69 percent from 49 percent in its interior electronics joint venture with Russia's Avtopribor. The move made Visteon a majority shareholder in one of Russia's leading cockpit electronics suppliers, said the company, whose customers include Ford Motor and Renault-Nissan-AvtoVAZ. Among the suppliers investigating whether to build a factory in Russia is GKN Driveline. "As the car companies move into Russia they're looking for companies like GKN to move with them to supply local content," James Voeffray, head of program management and strategy at the driveshaft maker, told Automotive News Europe. Separately, GKN Driveline CEO Andrew Reynolds Smith said the company would reveal its plan for Russia soon. Other suppliers are eyeing Russia. Transmission maker Getrag is working on a plan for Russia. "I think we would be able to announce something in the next three years," Getrag CEO Mihir Kotecha told Automotive News Europe. Safety specialist TRW Automotive also is interested in the market. "We have no reason not to support manufacturing in Russia," Peter Lake, TRW executive vice president of sales and business development, told Automotive News Europe. "It's just a question of time." BCG's recent report said that in the last two years Ford, General Motors, BMW, Renault-Nissan, Toyota, Mazda, Hyundai/Kia, PSA/Peugeot-Citroen, Mitsubishi, and Volkswagen/Audi have established or expanded capacity in Russia. Overall, $10 billion (7.6 billion euros) has been committed to manufacturing up until 2020. "After the crisis in 2009, carmakers now believe in the relative stability of market volumes, so that triggers the attention of the suppliers," Lang said. Carmakers are looking to source more parts from Russia to cut costs and to meet a government-mandated target of having 60 percent local content to qualify for reduced import tariffs. Ford is working toward meeting that target. "We continue our plan to localize materials in Russia to reduce logistics costs," Ford Russia CEO Ted Cannis told Automotive News Europe. "We continue to be pleased with the quality and commitment of our suppliers." Most individual brands' market share in Russia, however, will never be big enough to commit to building engine or transmission plants in the country. "In Brazil, where GM, VW and Fiat dominate the market with roughly 1 million cars sold each, they can warrant engine plants. In Russia, with the exception of Renault-Nissan-AvtoVAZ, all the other major OEMs are around 10 percent [market share] and then it's much more difficult to justify," Lang said. Currently AvtoVAZ, which makes the country's top-selling Lada brand, is the only carmaker with engine output in Russia, although VW will add an engine plant near its factory in Kaluga with an annual capacity of 150,000 units starting next year.